We got in from the bar at 1am that morning, and were up again unnecessarily at 6am to go through the rigmarole of waiting for news of the flight. 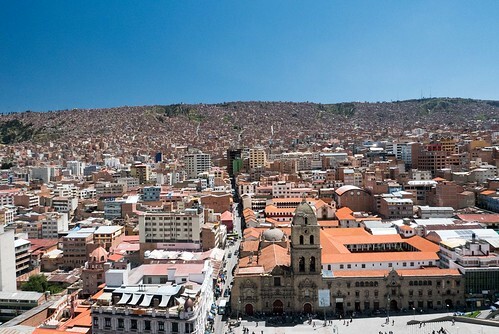 After collecting our laundry and a couple of pastries from Panadería Paris, we got a taxi to the airport again as a miscommunication with Amaszonas suggested that the plane had actually left La Paz. It hadn't. It was due at 8:15; by the time 9am came and we'd been told that there would be more information in an hour, we sacked it off as a lost cause and went back to the bakery for a stunning omelette. Whilst there, the sky did actually look like it was clearing and there was even a hint of blue in the distance. Things got better when an Amaszonas rep tracked us down at the cafe and told us the plane was setting off from La Paz in ten minutes. That left us plenty of time to get back to the airport, check in and wait to see if we could leave. Worryingly, the sky was cloudy as we left the town, leaving us to wonder if the airport had its own microclimate. We still weren't sure if the plane was going to be able to land, until we heard the chug of propellers forty minutes later, and a massive cheer went up as the tiny aircraft touched down. None of us were ready to believe we might actually leave Rurrenabaque until we were airborne and through the clouds. There was one last farewell treat in store by way of extreme turbulence which rocked the plane for a good half minute, before we finally landed in La Paz just before noon. 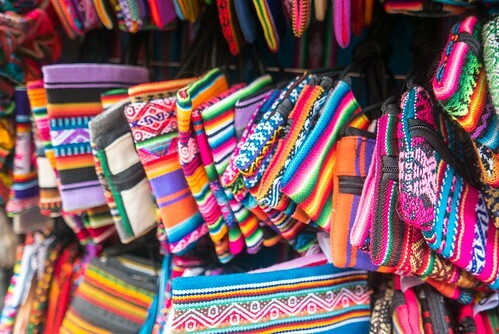 After ignoring the taxis and making a beeline for a colectivo, we were back in Loki half an hour later where we put on another load of laundry and said hello to the big backpacks we'd left behind a week ago. It was like being given a whole new wardrobe, and it felt glorious. 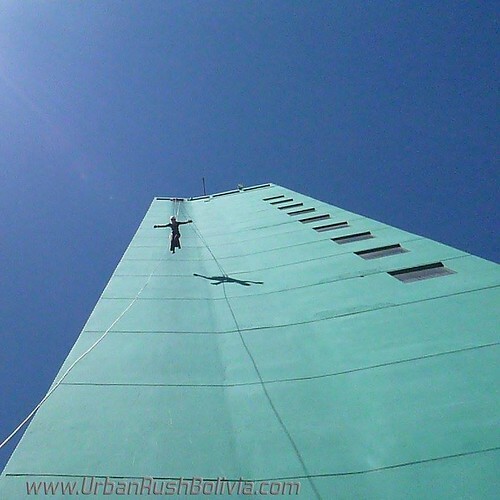 Since it was a Tuesday, we decided to jump off the side of a 17 storey building in the afternoon. 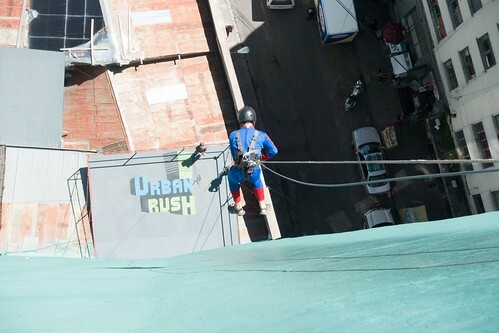 Urban Rush is an extreme activity which Fran and Ant had recommended where you can dress up as a superhero, strap into a harness and rappel down a massive hotel block. 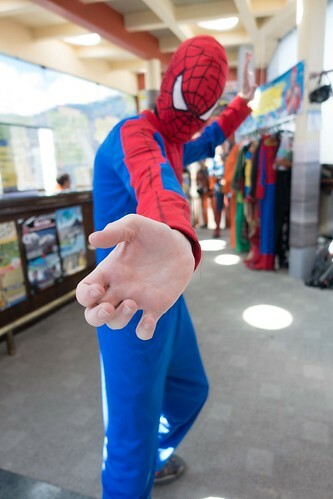 I chose Spider-Man (who else?) while Gilly opted for a black military number. They have a practice ledge inside where they teach you how to walk off the edge of the window ledge and jump down. 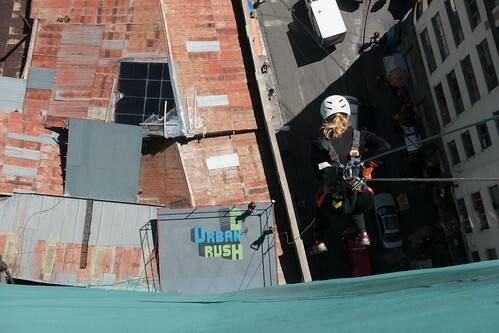 Unlike normal rapelling though, you can do this face-first to really get the adrenaline pumping. It's £15 for one go and £20 for two, so it was a no-brainer for me although Gilly was more than happy with one attempt. 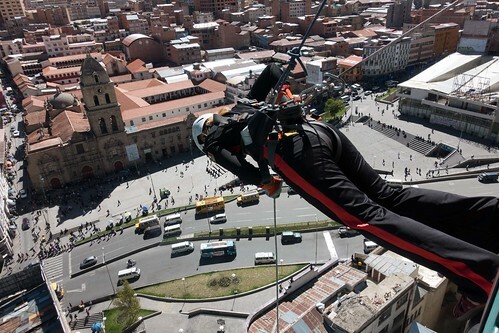 I've done bungee jumping before but this is a different beast, as you're forcing yourself to firstly trust completely in the ropes and the staff as you walk off the window ledge, and then continue to do so all the way to the bottom as you control your descent. After the initial scare, I actually found it really enjoyable, especially the last twenty metres or so where they yell "FREE FALL!" and you push away from the wall as hard as you can to hurtle down to the ground. Tremendous stuff. Even Gilly enjoyed it once she got the hang of the weird squat seating position you need to adopt as you descend. Tip: it's a lot cheaper if you book through Red Cap walking tours rather than direct, which we didn't find out until the next day. 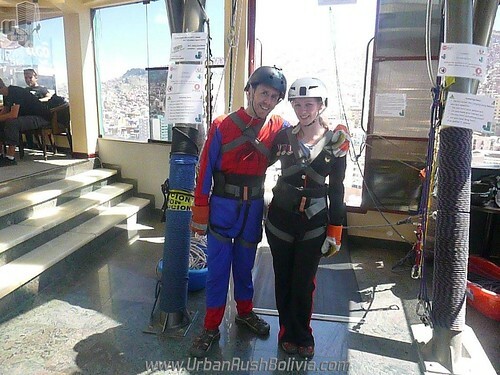 A more sedate afternoon followed, as we took the yellow cable cars up to the top of La Paz to enjoy the views over the city. There are three different sets of cable cars, but the yellow ones were closest to the centre and the end point wasn't far from Vinapho, where we'd arranged to meet up with Tom and Sally from our Mendoza wine tour. The ride is very cheap, and you can get off at any point you choose, so we decided to ride it to the top and then walk down to the halfway point. 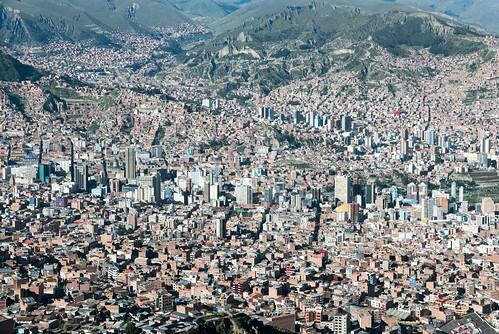 Until you're looking over it, it's hard to gauge the sheer scale of the city. The higher houses are in the poorer areas, and they are mainly brick buildings covered by tin roofing. Having walked down, it is easy to see why cable cars are necessary - the paths are incredibly steep, and we saw one poor gent who must have been at least 70 lugging a huge sack of clothes uphill from his house. We were running a little early, so we grabbed a beer in a dive bar and then went to Vinapho to catch up with Tom and Sally. They'd just got over dodgy stomachs so were very happy to get back onto the food wagon, and it was great to see them again. After stuffing ourselves with more Vietnamese food, we arranged to meet again for dinner the following evening and then caught a collectivo back to our respective digs. A walking tour was on the cards for the next day, since the Red Cap guys were supposed to be very good. They were. We were taken across the road from San Pedro prison, where tours used to be held but are now forbidden. The prison is an interesting setup with almost autonomous governance from the inmates themselves, where better cells and possessions (such as TVs) are bought for money, family are allowed to come and live with the prisoners, and there is a full-blown community. 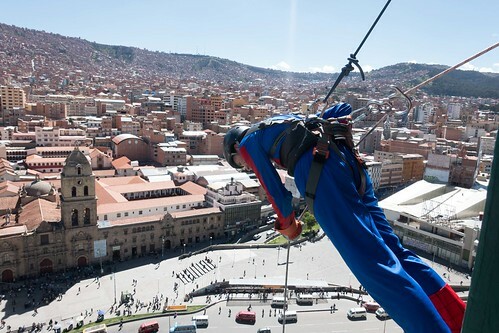 Where the guards come into play is unclear, and by all accounts it isn't really somewhere you'd want to spend any length of time, but unfortunately Bolivia has a policy of "guilty until proven innocent" so for most people there really isn't much choice. Not far away is a clock tower which is a little special, since the numbers are reversed. 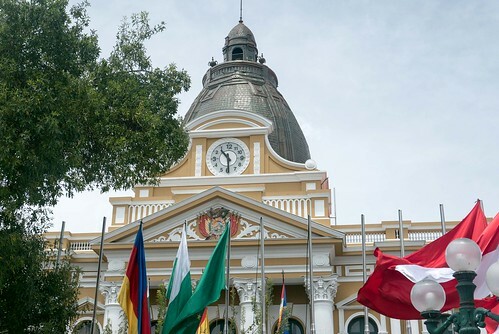 Apparently one of Bolivia's more egotistical presidents had it ordered, and instead of acknowledging the mistake once it arrived, claimed that it was actually what he wanted and had it put in place anyway. 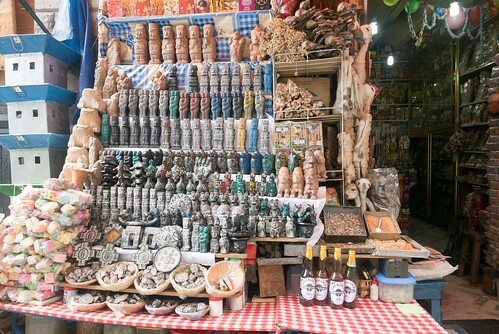 We had a walk around the Witches' Market, looking at all of the potions and powders on sale for every ailment you could name. 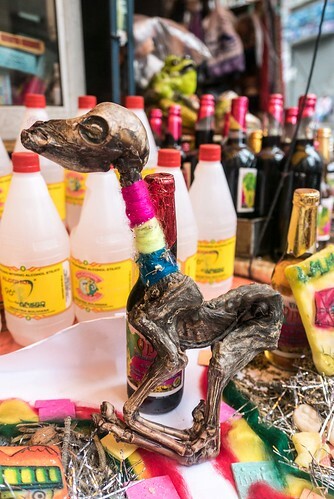 There were also dried llama foetuses in some shops, which are meant for good luck (not for the llama, obviously), but in general the market is a place for tourists to stock up on trinkets and postcards so we did both. Our guides told us that there used to be a tradition before building a new structure (temple, tower block, etc.) of making a sacrifice to Pachamama - Mother Earth. This was done by burying something beneath the foundations before construction started, and it had to be alive, so there are reports of people being drugged and buried alive beneath buildings in a sacrifice. This has apparently been confirmed by skeletons found in the foundations, but these days it's just black llamas which are sacrificed since society generally frowns upon humans being offed in the name of spiritual appeasement. The guides said that there are rumours that homeless / drunk people still sometimes disappear in order to enlist the blessing of new buildings, but I don't think this has been verified. Scary stuff if true, though. 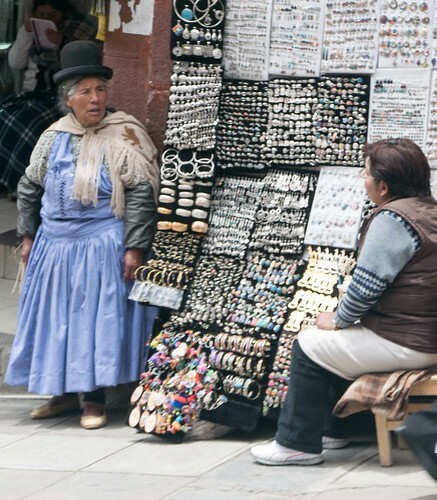 Ladies wear big bowler hats in Bolivia. According to our guides the English brought them over to sell to Bolivian men, but their potato heads (the guides' words, not mine!) were too big for the hats. So in a cunning marketing move, they somehow convinced the ladies that they would make an ideal fashion accessory. They believed it. Now the hats are everywhere and some of them cost an absolute fortune. Where the hat is placed on the head also indicates whether the lady is single or not, and remarkably the ladies balance them on their heads rather than using pins. Impressive stuff. Tom and Sally had joined us for the walking tour, and we also ran into Toby and Caz from Rurrenabaque, so along with another English couple who Tom and Sally had brought along with them (whose names I shamefully cannot remember), we had a big group for another excellent dinner in Kalakitas again that evening. 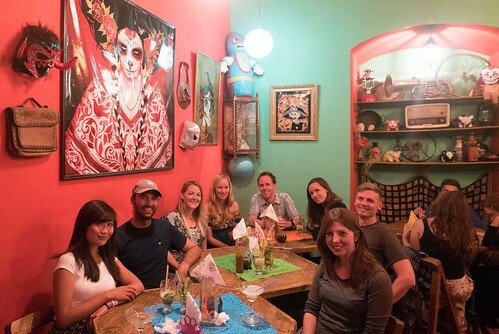 We generally don't visit restaurants more than once unless they are very special, but it seems that La Paz was an exception with us having Mexican three times and Vietnamese twice. Remy must have had the same idea, as we saw him in Kalakitas too. He had decided to take a taxi rather than wait for the plane, unfortunately on the same morning that it actually arrived. Many cocktails were consumed, and we showed Tom and Sally around Loki for an after-dinner beer once we were finished before calling it a night. 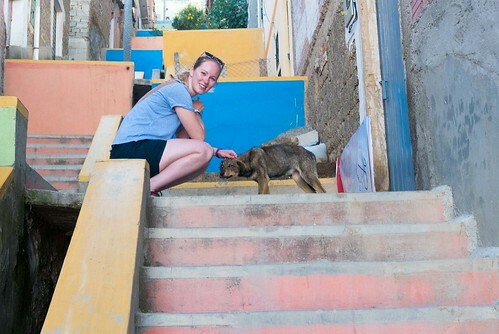 We had a bus to Copacabana booked for 8am the next morning, our last stop in Bolivia.